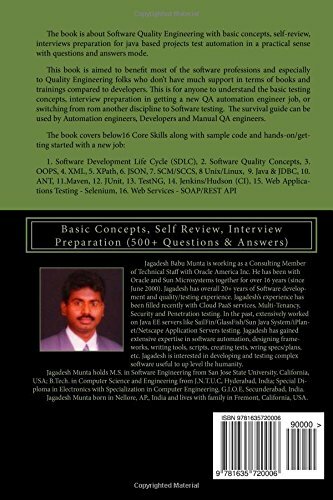 The book is about Software Quality & Java automation skills with basic concepts, self-review and interviews preparation related to the Java based projects in a practical sense with questions-answers. This book is targeted mainly at beginners to the software quality and development engineers. It is also useful for experienced quality engineers to do self-assessment and to be on top of relevant automation skills. It is hard to survive without having the fundamentals and automation skills in software development and quality as a QA or dev engineer. Also, many skills need references to many other books that were not targeted at QA professions. Now, this book is an attempt to create such survival guide for QA professional with all relevant skills at one place. This book should help in making sure that you get the basic core concepts, working knowledge and in summary as a survival guide for programming and automation with all required skills. The goal is not to aim at making you an expert at one skill or entirely on these skills. The focus is on finding the needed skills and at what level is being used for 80% of the time (80-20 rule) in the Java programming and Quality engineering profession. 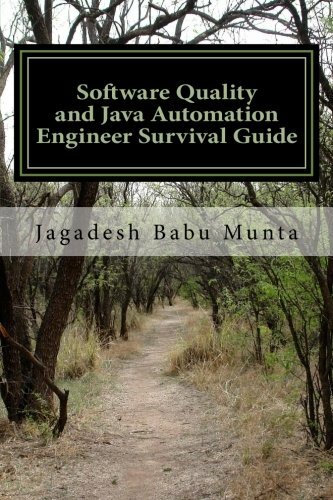 For the Manual QA engineer, this book helps in understanding the concepts and move from manual testing to automation. There are about 500+ questions and answers to ease on understanding the concepts and for review purpose. The below are 16 core skills covered in this book along with hands-on/getting started on a new job.